Like many grown-ups in America today, I was a big fan of Winnie the Pooh as a child. I even, I will confess, chose a Winnie the Pooh comforter and sheets to take with me to my dorm room when I went to college (I was definitely ready to become an adult in a worldly world, HA HA). All of my children had “Classic Pooh” themed nurseries and stuffed animals and blankies; Pooh and friends are truly beloved characters to me. 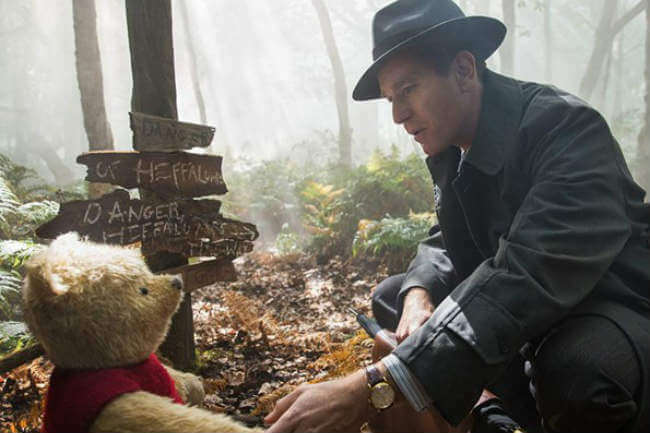 So, I was quite excited when I saw there was a Christopher Robin movie coming out that would follow Pooh’s best human friend into adulthood, and now doubt teach us all some valuable lessons. 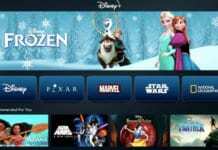 Now, my kiddos love Pooh, too, but I was wondering, especially for my seven-year-old, if the movie would be something they could get into or if it would be boring or just plain over their heads. The previews made it clear that grown up Christopher Robin had perhaps lost his way in adulthood when it came to remembering what was important and that a visit from his stuffed childhood chums and a return to the Hundred Acre Wood might help him sort that out. That seemed like a pretty good premise to me, I just wanted to make sure it was also a premise that wasn’t told in an overly-adult way. So, last weekend I went to see the movie with some girlfriends, and I must say that the Christopher Robin movie definitely lived up to my expectations and then some. While it may start out a little slow for kids, the action gets going—and gets hilarious—by the time Pooh and friends enter the scene. 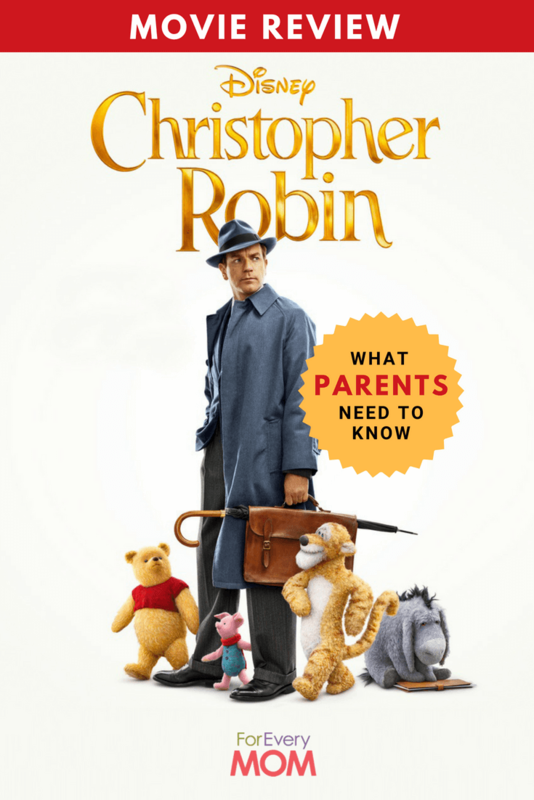 There are a few highlights I’d like to hit as to why I’d recommend the Christopher Robin movie for families, and some things parents might want to know going in. There’s some captions at the beginning of the film that catch us up on what happens to Christopher Robin between him leaving the Hundred Acre Wood and him being a married father of a tween daughter. If your kids don’t read yet, you might have to clue them in on what’s being said via text. Also, it’s a smidge boring for little one before Pooh finds Christopher Robin again, but it doesn’t take too terribly long to get going. No bad words or innuendos to worry about. HOORAY! I kind of love that Disney is enforcing a Biblical principle here in the Christopher Robin movie. Time and time again, Pooh heralds the joys of doing nothing, of how being un-busy and doing nothing can lead to the most wonderful “something” if we let it. It definitely made me think about the Bible’s command to “Be still and know that I am God.” There is joy and value in rest and in just…being. Christopher Robin, when we meet him at the beginning of the film, is choosing his work over his family, and he’s also preparing to send his daughter off to boarding school because it’s “the thing to do.” The Christopher Robin movie underscores for parents, through Christopher’s relationship with his daughter Madelyn, that choosing work over time with your kids is not always the best choice, and that time together is something you can’t get back once you give it up. Pooh’s child-like solutions to Christopher Robin’s problems, are, in a world…beautiful. The Christopher Robin movie reminded me that adults often over-think and over-complicate our lives, make mountains out of mole hills, and forget how to just relax. The lifestyle portrayed by the friends of the Hundred Acre Wood was a breath of fresh air, and hard to argue with. Pooh and friends may be silly, but they are also kind, encouraging, and filled with determination to help others. They don’t sweat the small stuff and they don’t take life’s simple pleasures for granted. As far as characters in kids’ media today go, I’d much rather have my children emulate the characters in the Christopher Robin movie than just about any other. All in all, the Christopher Robin movie was great fun, lots of laughs for parents and kids alike, and truly appropriate family entertainment. I already can’t wait to see it again. Have you taken your kids? What did you think?